Armoured Skeptic is a Canadian sociopolitical commentator. He produces high-quality content with intricate animations and well thought out arguments to promote critical thinking and skepticism. We had a fantastic conversation about the Transinvestigation community, Jon Hamm and "White Thoughts", Mythcon and more! Karen Garst The Faithless Feminist on Mythcon, Women V Religion and More! Karen Garst joins us live to discuss her upcoming conversation on stage at Mythcon V. We also discuss her new book and the current state of Atheism in the US. Karen L. Garst holds a PhD from the University of Wisconsin, Madison. She retired as executive director of the Oregon State Bar in 2008. She has edited two anthologies about women and religion: Women Beyond Belief: Discovering Life without Religion and Women v. Religion: The Case Against Faith… and for Freedom. Courtney Heard aka Godless Mom is a blogger, podcaster, and YouTuber that covers atheism and all of the topics that surround the community. She has also started to cover topics outside of atheism on her various platforms. We always have a great time talking with Courtney and have a ton of respect her and her work. Claire Lehmann is the founder and editor of Quillette, one of the world's fastest growing platforms dedicated to free thought, reason, and heretical ideas. She is also a writer with a degree in psychology, and her work has appeared in Commentary, Scientific American, The Sydney Morning Herald and Psychology Today. 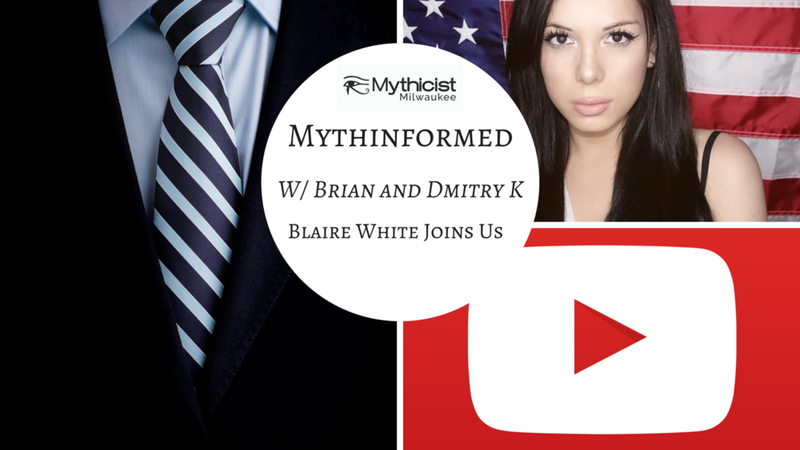 Blaire White Discusses Her Tour, Mythcon and More! Blaire White is a Youtuber & conservative political commentator. She is best known for tackling controversial topics on her channel from the unique perspective of a conservative transgender woman. Stephen Knight is a blogger and host of award-winning 'The Godless Spellchecker' Podcast. He is a critic of religion and propenent of freedom of expression. He has featured on the BBC's flagship ethical debate show and frequently reports from UK secular conferences. Jeff Holiday and Wizard of Cause from the YouTube Saints join us live! Derrick Blackman, aka SomeBlackGuy, is a YouTube content creator with more than 270,000 subscribers. Coining himself "a radical centrist," Blackman regularly discusses social, racial and political topics that affect and influence pop culture. Sarah Pearson Women’s March WI Co-Founder and Co-Chair. and Peter Isley Founding Member of the Survivors Network of those Abused by Priests join us on Mythinformed. Ian Miles Cheong is a journalist who writes about entertainment, video games, politics, and culture for the Daily Caller. Today we are joined by the lovely Josephine Mathias, a prominent YouTuber with over 100 thousand subscribers who averages tens if not hundreds of thousands of views of her content. With her Poli-Sci background, Josephine likes to discusses political, social, and what we'll call "controversial" topics all while being a stalwart defender of the Freedom of Speech. Fighting for the forces of truth, Josephine joins us live to tell us how we're Mythinformed about victim-culture! Peter Boghossian joins us to discuss his upcoming panel at Mythcon as well as the difficulty that we are having, booking speakers for the intersectionality panel. We also discuss the difficulties with platforming certain ideas and individuals as a result of slanderous and fraudulent online criticisms. Dr. Richard Carrier joins us in studio. 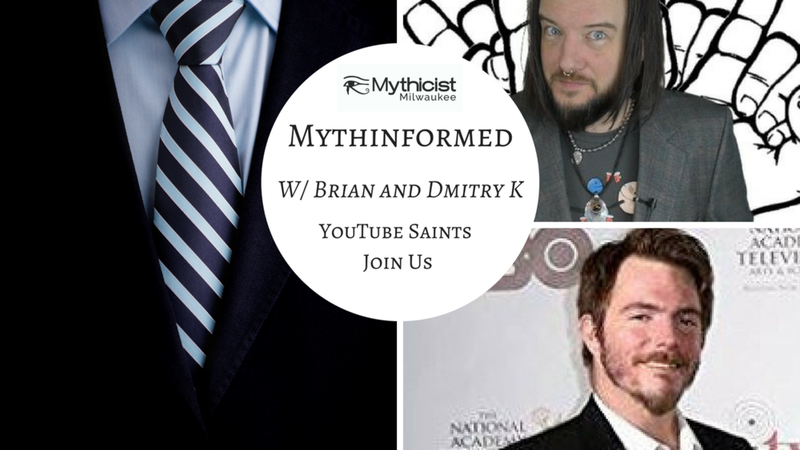 We will be previewing his upcoming discussion with Sargon at Mythcon. We will also discuss the dwindling interest in the atheist community and the refusal to innovate. Today we're speaking with a talented young artist named Lisa Nani. She is an animation fanatic, Nickelodeon storyboard artist, and sporadic YouTube creator who doesn't shy away from combining socio-political commentary with her art.